Best Ab Machine? Is the Ab Circle Pro Endorsed by Jennifer Nicole Lee any Good? Is the Ab Circle Pro the Best Ab Machine? Promoters claim that the Ab Circle Pro is the best ab machine, but should you invest in one? 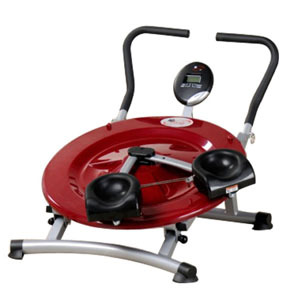 The Ab Circle Pro is endorsed by fitness model Jennifer Nicole Lee, and it is one of the many as seen on tv ab machines. I actually watched the entire infomercial, and as a personal trainer and physical therapist I was not impressed with the presentation. I would not recommend this machine to clients, and I personally would not invest in this or many of the as seen on tv ab machines. But, I have not used this machine, so I cannot speak about it from personal experience. It costs about $200.00, and in many places $200 will pay for a yearlong gym membership. You can buy a few dumbells, a bosu ball, a medicine ball and a stability ball. for about $200. And I think that would be a better investment. But again, I have never used this machine, so if you have used this ab machine before, tell others what you think by filling in the form below. Some ab machines might give you a slightly different workout, but many may be a waste of money. If you've use the Ab Circle Pro, tell us about your experience. Did it work your abs? Was it easier or harder than other ab exercises? Was it comfortable? Were you sore the next day? Did you hate it? Share as much as you what about your experience with the Ab Circle Pro!